Your eyes were not playing tricks on you this afternoon. It definitely looked hazy and smoky outside. Haze and smoke could been seen from Iowa, Illinois, Wisconsin and Minnesota much of Thursday morning and afternoon. The reason: smoke from large wildfires burning in central and northern Canada. A cold front came through late last night. Cooler and more dense air followed the front, providing a sinking motion in the atmosphere. As the jet stream turned more northwest this morning, the smoke from the wildfires were caught within the winds of the jet stream and transported southeast, into the Midwest. While we've seen smoke from wildfires as far north as Canada and the northwest before, today was a little more rare. That's because the smoke was pulled down towards the surface of the earth, reducing visibility for some time in many locations. Sinking air from the top of the atmosphere down to the surface brought the smoke downward. Visibility in some locations has improved from earlier, and this should be the overall trend we see through the night. However, if the smoke lingers a little longer into the night it could get 'trapped' near the surface keeping the hazy look around through Friday morning. The lingering smoke could make for a colorful sunset Thursday evening. Smoke particles act as filters in the atmosphere for sunlight, scattering the shorter wavelengths of light and leaving the longer ones behind - like orange and red. The lower the sun is on the horizon, the longer the light has to pass through the atmosphere making the colors extra bright. We had a cloudy start to this Thursday, but it was still a better start than what we had the past two mornings with the dense fog. Skies are starting to clear a little more, and they'll continue to do that going through the afternoon. Slight rain chances still in play for our southern counties, as a few spots of light rain have developed over in southwestern Whiteside county. Any rain that does form will die down by mid-day. High pressure will keep our skies mostly sunny this afternoon, but it'll also pull in some cooler air from the north, which is why we'll only see the mid 70's this afternoon. The skies will completely clear for the overnight, where we'll cool down a little more into the low 50's, possibly the upper 40's in a few locations. We hang on to the clear skies for Friday, with lots of sunshine and temperatures in the mid 70's again. Once we get into the weekend, that high pressure system will track east, and while this will keep the skies clear, it'll also warm up our temperatures. We'll hit the low 80's on Saturday, around 83° on Sunday, and then the mid 80's on Monday. However, the increasing temperatures do bring storm chances. First storm chance is Sunday morning, but after that we stay dry for the afternoon. Another storm chances comes in late Monday afternoon, after which a strong inflow of cold air will cool us down. We could possibly see the mid 60's by the time we get to the middle of next week. Harvey got downgraded to a Tropical Storm, as winds have weakened down to 35mph. 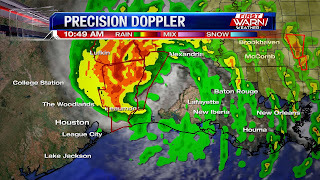 The system is moving through Louisiana and now tracking over into Mississippi. Texas is not expected to get any more rain, so at least they have some relief in that regard. Rainfall will extend up north, with areas of northwestern Tennessee expected to see over 6" of rain between this morning (Thursday) and Saturday afternoon. Other areas will see between 4 to 6" of rain (in yellow) including central Tennessee, and a parts of Kentucky. Less than 4" of rain (dark green) will be seen in eastern Tennessee, even extending into West Virginia. The light green indicates lighter rainfall, so overall the accumulations are going down, however they're still not great given that 4" and greater is still a heavy amount of rain. Tropical Depression Harvey will push northeast as we head into the weekend, and is expected to die down Saturday afternoon. In total, from when Harvey hit land to when it dies down, some areas along the coastline will have seen around 50" of rain. That's a little over 4 feet! 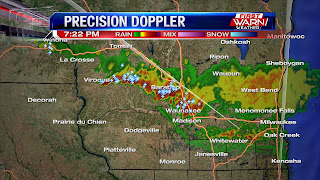 An incoming line of showers and thunderstorms from Wisconsin will continue to sink south through the evening. These will be near southern Wisconsin between 7pm and 8pm, and into northern Illinois between 8pm and 10pm. Severe weather is not expected as the rain is moving into an environment a little less favorable for any storm growth. In fact, we may see some of these fizzle out before reaching the state line. The thunderstorms formed ahead of a cold front, brought on by high pressure up north. This front will move through northern Illinois by early Thursday morning. There will be a little low level moisture behind the front, which will likely keep skies mostly cloudy for the start of Thursday. As drier air gets pulled in behind the front, skies should turn partly cloudy with temperatures warming only into the mid 70's. What started as another foggy day has now turned into beautiful scenery. Some locations up north didn't see any fog at all, including Monroe and Beloit. The reason for this was that winds were a little faster up north, at around 5-6mph. Doesn't sound like much, but its enough to make it difficult for fog to form. Nice, sunny skies now dominate the Stateline and it'll stay this way through mid day. Clouds will build going through the afternoon, but we'll still get plenty of sunshine with temperatures in the upper 70's to low 80's. The skies will clear again for the evening, but then a weak cold front will move down from the north, bringing chances for rain during the overnight, as early as 1am. The rain will linger until the early, moving out of our area around 7am. Once the rain clears out, the cool inflow will continue in our area, keeping temperatures in the mid 70's for tomorrow afternoon. However, we'll get plenty of sunshine to go along with it. As we head into the weekend, a high pressure system will dominate our area, keeping our skies nice and sunny, which will allow our temperatures to gradually warm up going into the weekend. We'll peak in the mid 80's by Monday, but our storm chances will increase Monday evening when a cold front moves through. After the front, we're expecting cooler temperatures through the rest of the work week next week. up north to parts of southern Illinois, and even over into Kentucky. Rain accumulation between now and Saturday is much lower compared to the passed few days, but some places are still expected to see around 10 more inches of rain. Harvey will track northeast as we head into the weekend, and more than likely will become a Tropical Depression by the time Friday rolls around. The system will move into Kentucky on Saturday, dying out by the evening. Total rain accumulations from when Harvey struck to when it's expected to die off will total 50" in a few locations. 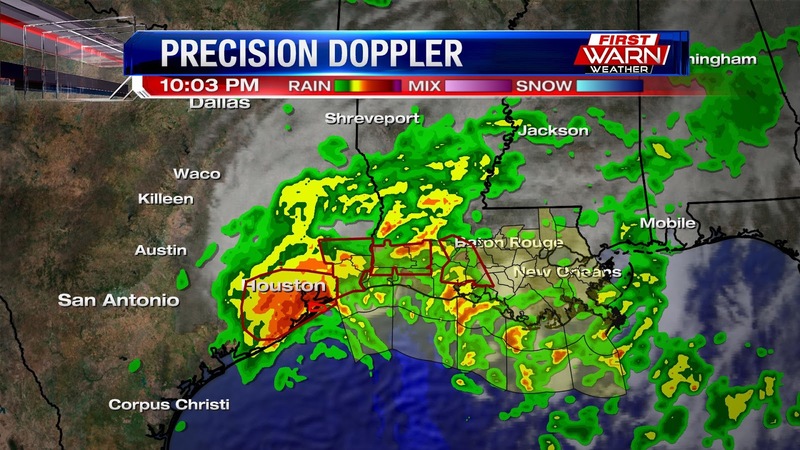 Multiple flood warnings still in place in southeast Texas, with numerous Flash Flood Warnings now in place over Louisiana. An abrupt pattern change next week could take our temperatures from the 80's over the upcoming holiday weekend, down possibly into the 60's by the middle of next week. Heat has been building over the western U.S. and will continue through the end of the week with high temperatures reaching 90 degrees in the interior Northwest, to 100 degrees over California and southwest. Some of that heat could be pushed east ahead of a cold front into the Midwest and Great Lakes late this weekend. This may take highs, especially on Monday, into the upper 80's. Following the warm up, though, a strong low pressure system will develop near Hudson Bay causing the jet stream to dip well south into the Midwest and Great Lakes, pulling a very cold air mass southward. Locally, high temperatures may struggle to make it out of the 60's following the passage of a cold front Monday night/Tuesday morning. The chill won't last long, though. Temperatures look to moderate back near normal into the following weekend. The warm days of summer have taken a little break this past week. Highs for the past seven days, today making it eight, have been in the mid 70's. The last 80 degree day we've had in Rockford was back on August 21st, when the temperature reached 84 degrees. Since then we've been in a bit of a cooler pattern - a pattern that looks to last through the end of the month. We'll see a little surge in the temperatures tomorrow with highs coming close to 80 degrees, and then again by late Labor Day Weekend. Fog starting to clear up nicely across the Stateline with visibilities becoming much more manageable. There are still a couple of foggy areas, but those areas are seeing the fog evaporate pretty quickly. All the fog across the Stateline should be evaporated around 11am. We'll see scattered cloud cover going through the day, with a chance for showers out east as there's a small area of instability just off to the east. Clouds will clear up more during the late afternoon, when higher pressure starts settling in. This will give us more sunshine, and boost our temperatures into the upper 70's. The skies will completely clear for the overnight, cooling us down into the mid 50's. Our wind speeds will also drop, and unfortunately both clear skies and calm winds during the night are recipes for thick fog development, so we could have another overnight filled with dense fog coming up. Luckily, the high pressure influence stays with us for the rest of the week, keeping the skies sunny and allowing for mild temperatures in the upper 70's to low 80's, with Friday being an exception as we'll only hit the mid 70s that day due to cooler inflow out of the north. That high pressure influence is expected to stay with us through the start of next week, where we'll start to see temperatures warm back up again into the low to mid 80's for Monday. slightly moved back out over the Gulf of Mexico. There's almost no friction over water, and this makes it easy for wind to flow more freely, and this why winds have increased a little bit. 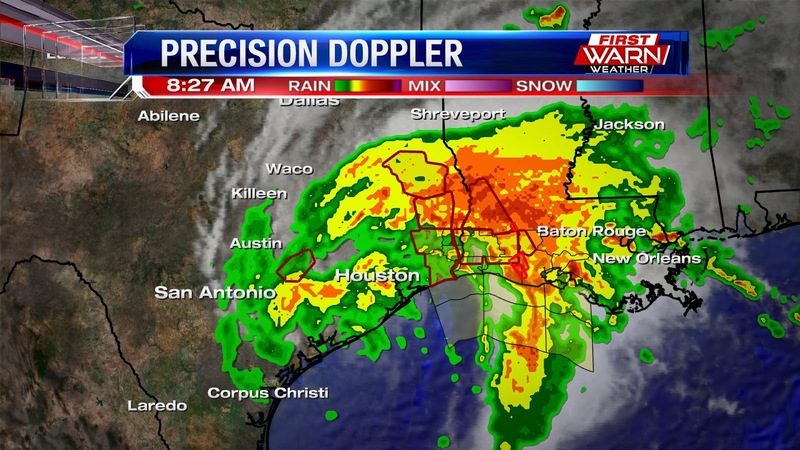 Moisture is continually being pulled off the Gulf, now keeping the rain pouring down on the Texas / Louisiana border. 10-15" are expected in a few areas between now and Thursday, and some areas will receive a total accumulation from when Harvey moved in to Harvey dying down of around 50". The system will track northeast as we head into the weekend. A pool of hot, humid air will settle in around Kentucky and Tennessee, and this will attract Harvey to that area. That pool of warm, humid air will die off early on Sunday, and by Sunday afternoon is when Harvey is expected to die off. I can't even begin to wrap my mind around the flooding that has been taking place in and around Houston, TX these past few days. 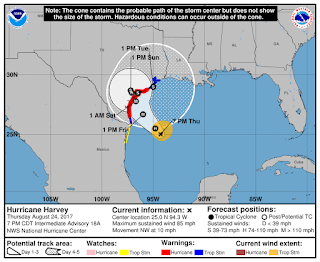 Hurricane Harvey made landfall late Friday night near Rockport, TX. Winds over 120 mph were recorded as structures were torn apart, the memories of residents blown away in just one night. 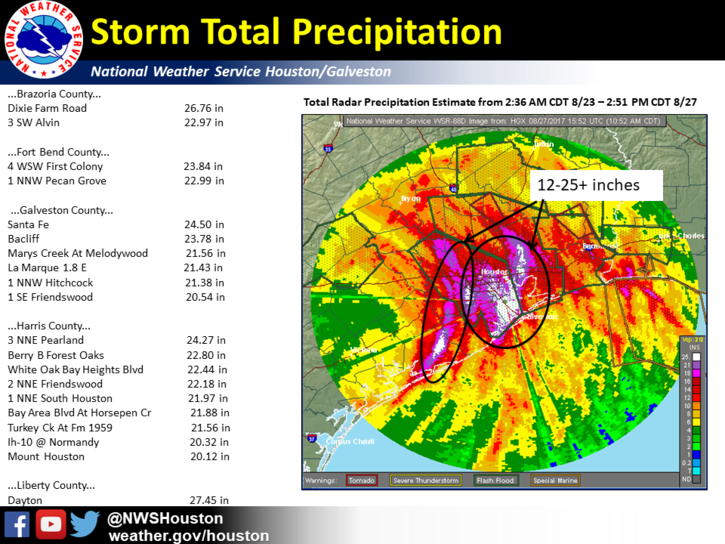 As the storm ever so slowly meandered over southeast Texas, intense heavy rain bands began to set up late Saturday and Saturday night right over Houston. Over 15 to 20 inches of rain came down Saturday night and with additional rainfall through Sunday and Monday, rainfall totals have added up to over 30 inches in a few spots. Thirty inches of rainfall! To put that into perspective, the amount of rainfall some locations have received this past weekend near Houston are over their yearly rainfall averages. There are many wondering why city officials didn't decide to evacuate the city before the storm hit. Many of us may remember what happened when millions tried to evacuate before Hurricane Rita in 2005. The interstates were backed up for days. If over 6 million people (population of Houston) tried to leave on the interstate before the rain, the devastation and death toll would have been significantly higher. Harvey has been downgraded to a Tropical Storm, but it's important to not solely focus on that. The center of circulation is currently just off shore, expected to make landfall again Wednesday near Beaumont, TX as a Tropical Storm. 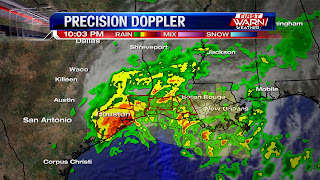 What we need to focus on now is the continued flooding threat moving over Southeast Texas, and now moving into Louisiana. Over 3,000 people have been rescued from rising water, with 30,000 people seeking refuge in shelters. Both those numbers will likely climb within the next few days. Residents have been helping residents as emergency personal have been stretched to their limits. The help needed in Texas is going to be needed for many months, and maybe even years, to come. It's important we remember those that were also in the direct path of when Hurricane Harvey made landfall, in Rockport, TX. They, too, have a long road of recovery and rebuilding ahead of them. To help, you can visit the Red Cross website, or text 'Harvey' to 90999 to donate $10 off your next cell phone bill. Widely scattered showers and isolated thunderstorms developed Monday afternoon and evening. 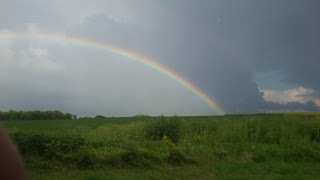 These were a result of an upper level low pressure system spinning over northern Illinois and southern Wisconsin. Temperatures at the surface warmed just enough to quickly rise into a fairly cold air mass several thousand feet above the surface of the earth. While not severe, some of the stronger showers/storms did produce brief funnel clouds over Wisconsin, LaSalle County and near the Quad Cities Monday afternoon. None of the funnels touched down. As we get closer to sunset, the activity on the radar will continue to fizzle with only a few thunderstorms remaining south of Chicago and over east-central Illinois. There will remain only an isolated shower threat into the overnight, but I think we could see locally dense fog develop by Tuesday morning. 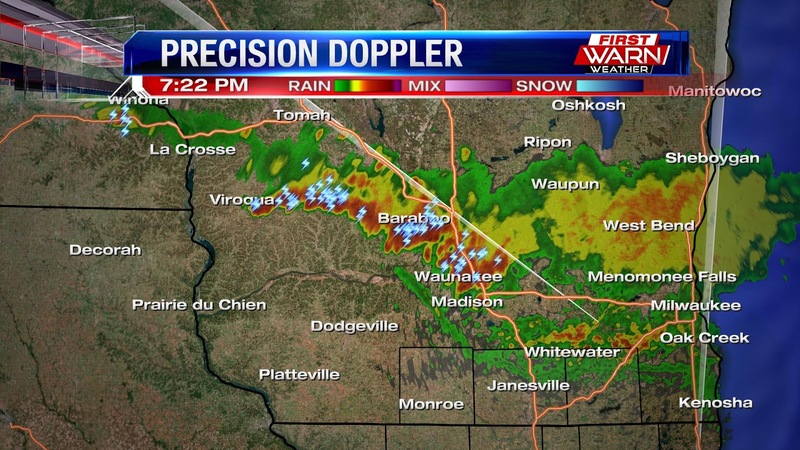 That may be a bigger issue for the Stateline tonight. It's not exactly the best way to start a Monday; dense fog and light rain showers. Luckily, visibilities have become more manageable, with Rockford still being at around 4 miles visibility. Within an hour, those visibilities will be back to normal, but unfortunately the rain will remain. 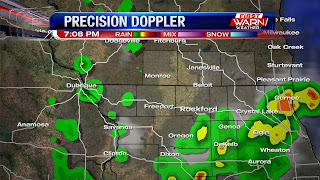 Isolated rain showers will stay in play the entire day, with storm chances in the afternoon. The storm chances will be for our eastern counties starting at around 1pm, but everywhere else will see the isolated showers. The cold front, which will develop the thunderstorms over our eastern counties this afternoon, will clear out around 7pm, and at that time those isolated rain showers should die down. We'll stay clear going through the overnight as we'll have cool, dry inflow from the north, bringing temperatures into the upper 50's. That cooler inflow won't affect temperatures a whole lot tomorrow, but it'll clear our skies and allow to have lots of sunshine! This will affect our temperatures, bringing them into the upper 70's. Even more sunshine will be seen Wednesday when we'll have a more high pressure influence over our area, and this will warm our temperatures even more into the low 80's. The high pressure system will push in more cool air on Thursday and Friday, cooling our temperatures back into the mid 70's, but we still hang on to the sunshine. Unfortunately, the nice weather doesn't last forever as warm, humid inflow will channel into our area for the weekend. We'll also have a low pressure system move in, and both of these factors will also for thunderstorm development both Saturday and Sunday. Tropical Storm Harvey's winds have died down quite a bit since yesterday, now down to around 40mph, which is only a couple miles per hour away from being downgraded to a Tropical Depression. 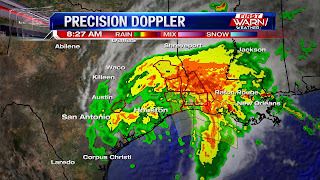 However, the system is nowhere near done with the Texas Coastline, as moisture continues flowing onto the land, generating more heavy rain bands. Over 20" has fallen so far in a few locations, with 20 more inches expected to fall during the week. Total accumulations in some areas, from when Harvey moved in to when it dies, will add up to around 50". That's 4 feet of rain!! 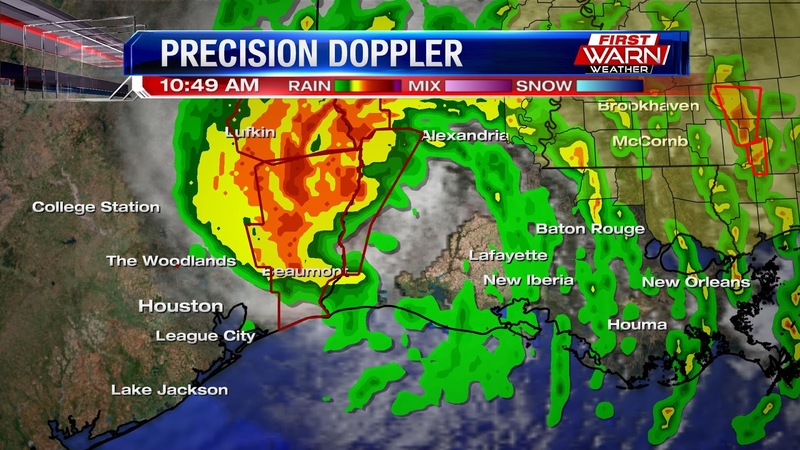 Along with the rain, 30 tornadoes have been reported so far in Harvey, and a few tornado reports are already showing up over in Louisiana, where the heavy rain bands have expanded to. The coastline has gotten a lot of everything; heavy rain, tornadoes, and very strong winds. Tropical Storm Harvey is expected to push towards northeast Texas, where it's expected to die out this weekend. Tropical Storm Harvey continues to bring copious amounts of rain to eastern Texas. Original forecasts called for 20 to 30 inches of rain, and now the National Hurricane Center is saying the storm could drop up to 50 inches in some areas before everything is over. One of the key problems is that Harvey is in an area of very light steering winds aloft and stuck between 2 high pressure systems. Because of that situation, Harvey will continue to meander in the east Texas region, currently only moving at 2 miles per hour. 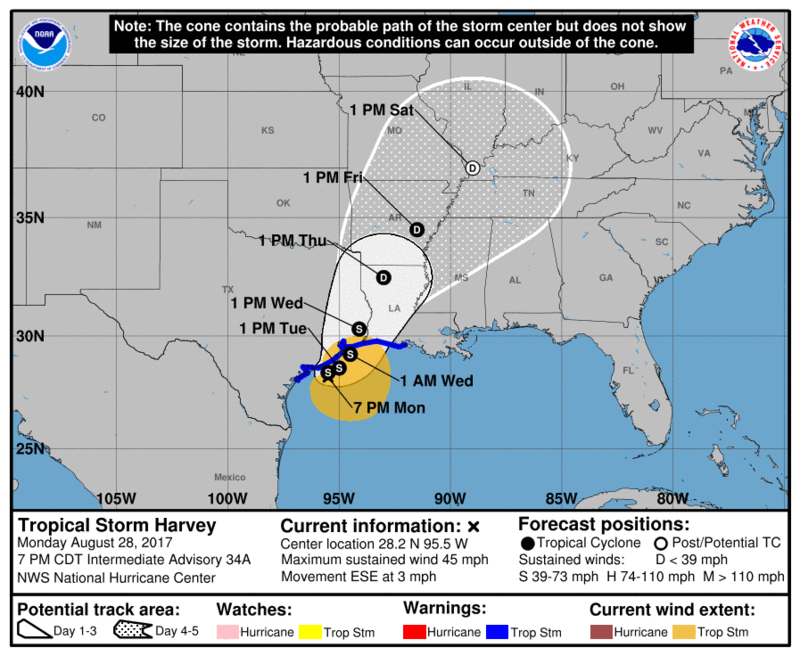 The above prediction shows that by Friday, Harvey is expected to finally exit Texas and move into southern Arkansas. By the time this storm is over, it will certainly go down in history as one of the worst flooding events ever. Not exactly the way we wanted to start the weekend with all the rain, and unfortunately the rain will linger with us through the evening. However, as we go into the late-night hours, we'll start to see a few breaks in the rain. We'll stay mostly cloudy during the overnight, even with the breaks in the rain, and temperatures will be a little warmer in the low to mid 60's. More rain will move in tomorrow morning though, as a cold front will approach our area. The front will move in around 1pm, where we'll start to see a few thunderstorms develop out in our western counties. The front won't move a whole lot during the afternoon, which will keep the storms lingering in a few areas. The front will slowly track eastward during the evening, moving halfway through the Stateline by around 10pm. At this point, thunderstorm development will be hindered since it'll be cooler overall, so the front won't have much to work with. However, we may see a little bit of rain during the overnight. The front will towards our eastern counties around 1pm on Monday, by which temperatures will be warm enough to trigger some storm development along the front, but these storms would be confined to our eastern counties during Monday afternoon. The front will clear out around 7pm Monday evening, after which we'll stay dry for the most of the week before more rain moves in Friday night for the weekend. Temperatures will stay in the upper 70's to start the week, even after the cold front moves out as there will be a good amount of sunshine. We'll dip to the mid 70's for Thursday and Friday, before warming up a little more for next weekend, but the warmth and moisture will help fuel showers and thunderstorms. Harvey is now a Tropical Storm as winds have gone down to 65 mph. However, the storm is nowhere near done with the Texas Coastline, as multiple storm surge warnings and flood warnings are still in place in many areas. There have also been multiple tornado warnings, and the tornado warnings keep climbing. As of this writing, there's been 16 total tornado reports since yesterday evening, some of which were in Houston and Galveston. Heavy rainfall is also still occurring, with many locations still expected to see over 20" of rain after the storm dies down, and a few isolated locations could very well see up to 40" inches of rain. The storm is still expected to die down by the middle of next week. Overall a fairly nice evening across the Stateline, with temperatures in the upper 60's to low 70's with partly cloudy skies. A couple of isolated rain showers down to the south, but these will stay down south, keeping the Stillman Valley football game nice and dry. A few more showers are moving in from the northwest, but these should fizzle out before reaching our area. We'll stay partly cloudy for the overnight, where we'll cool down to the low to mid 50°s. More than likely there won't be any locations that hit the upper 40°s. Some moisture inflow from Hurricane Harvey will move into our area this weekend, giving us rain and storm chances. We'll go into Saturday afternoon mostly cloudy with a slight chance for rain, but the better chance for rain shows up when the warm front will move in a little closer around 7pm. The rain will linger during the overnight, with a cold front expected to move through Sunday afternoon. This will bring us some thunderstorms, a couple of which may produce a few strong wind gusts. The cold front moves out around 10pm, after which we're looking to stay fairly dry going into the work week. Temperatures will be in the upper 70's during the weekend, and then cool down to the mid 70's during the work week after the cold front moves out Sunday night. We're not expected to hit the low 80's across the Stateline again until the middle of next week. 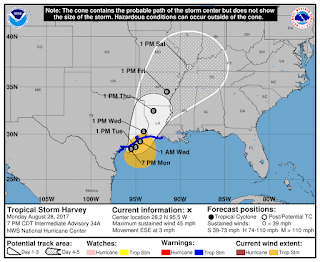 Lift-threatening flooding and high storm surge are possible along the Gulf coast of Texas over the next several days as now Hurricane Harvey, a Category One hurricane, spins in the Gulf. The strength of Harvey hasn't increased too much Thursday afternoon, but forecasts from the National Hurricane Center have Harvey strengthening to a major hurricane, Category Three, by Friday. Recent aircraft data show the central pressure of Harvey has dropped to 974 mb, but winds within the storm haven't changed much from earlier in the day. Maximum sustained winds are 85 mph and the storm is moving northwest at 10 mph. 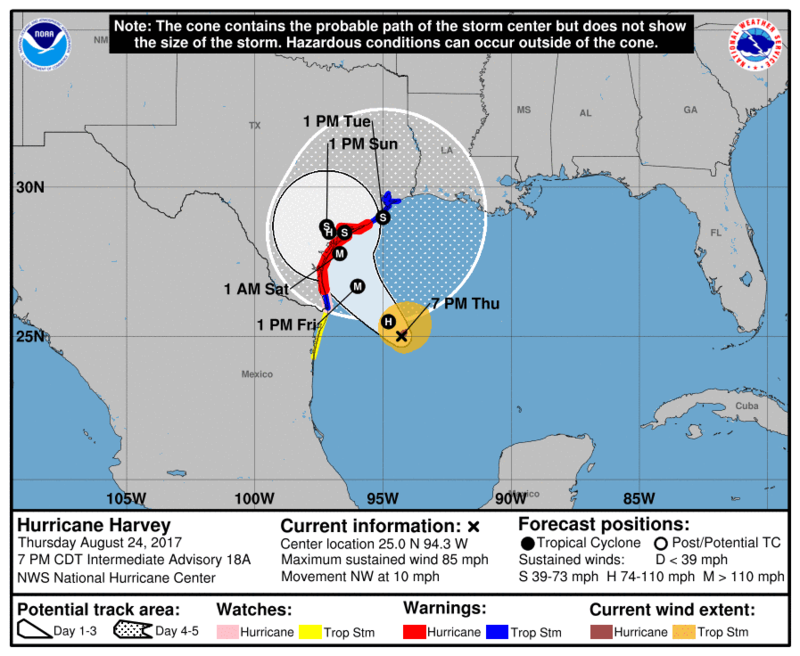 Hurricane Harvey is expected to make landfall near Corpus Christi either late Friday or early Saturday morning. High pressure over the eastern Gulf of Mexico is the driving force for Harvey, but blocking high pressure over the western United States will cause Harvey to slow down, and possibly move back out over the Gulf this weekend. Either way, a significant amount of rainfall is expected to occur over the next 5-7 days. Rainfall totals over two feet could be recorded in some places. Evacuations have already been ordered for coastal cities as residents board up their homes and travel further inland. The first Friday night football games start tomorrow and the forecast should cooperate for most. Skies may be a little cloudy at times, but any rain should hold off until late in the weekend. You may want to bring a jacket, though. Temperatures at the start of the varsity game will be in the upper 60's, to near 70 degrees. We had a weak disturbance off to the east, which increased our cloud cover early this morning. That has since moved out, and now we're getting more clear skies across the Stateline area. Clouds will build up a little bit going into the afternoon, with scattered cloud cover, but it won't be overcast. Highs will only be in the mid 70's as we have cool air flowing in from the north. The skies will completely clear for the overnight, where we'll cool down to the upper 40's to low 50's. Tomorrow will be similar to today, except that we'll see more sunshine in the afternoon. We'll have great weather for the high school football games; partly cloudy with temperatures around 70°. A low pressure system will approach from the west for the weekend, and will increase our cloud cover going into the overnight. However, no rain is expected. That low pressure system will move into our area for the weekend, bringing our temperatures into the upper 70's. However, that'll also increase our chances for showers and thunderstorms. Showers are likely during the late-night hours of Saturday, with thunderstorms expected Sunday late afternoon. The low will bring a cold front through during the evening, after which we'll hang on to some cloud cover going into the work week, with temperatures staying in the upper 70°s. It was a chilly start, but the clear skies allowed for lots of sunshine to start this Wednesday, which warmed up our temperatures pretty quickly. However, we still have some cooler inflow coming out of the north, and this will keep our temperatures cooler today in the upper 70°s again. Some clouds will develop during the afternoon, but we'll still see plenty of sunshine to accompany the nice, mild temperatures. The skies will clear again for the overnight, where we'll dip into the low 50°s again. However, winds will be calm during the overnight, and this will make it easy for fog to develop, so we could see some widespread fog during the overnight. However, it'll only be a light fog, nothing dense. Tomorrow will be the coolest day out of this cool period, as we'll only get into the mid 70°s during the afternoon. We'll have scattered cloud cover during the afternoon, which is why temperatures will be in the mid 70°s as opposed to the upper 70°s. After tomorrow, temperatures will start warming back up again, eventually getting back into the low 80°s by Saturday. However, one of the reasons for the warmer temperatures will be due to a low pressure system approaching from the west. This will increase our cloud cover going into the weekend, as well as our rain chances. However, rain is not expected until during the overnight Sunday night. That way, the rain can't ruin your daytime plans for the weekend! Even though it'll be cloudy this weekend, it'll be nice and dry with temperatures in the low 80°s. We are nearing the peak of hurricane season and have begun to notice an uptick in tropical activity over the past several weeks. Low pressure associated with the remnants of Hurricane Harvey have formed near the Yucatan Peninsula, moving into the southern Gulf of Mexico. Current forecasts suggest that this low will be moving into an environment that will be a little more favorable for possible Tropical Depression or Tropical Storm development within the 24 to 48 hours. Currently the low is moving to the northwest around 10 mph. Even if development into a tropical system doesn't occur, the low will more than likely bring heavy rain and possible flooding for parts of Texas and southwest Louisiana as it slows down before reaching the coast. The image on the left is the projected 7-day rainfall totals for the United States. Notice the significant amount of rainfall possible for Texas and other Gulf States, along with southern Florida. Another low pressure system, while likely not developing into anything significant, will bring heavy rainfall to parts of Florida later this week. How this low develops and tracks in the Gulf, and into the south, will also have an impact on our rain potential late this weekend and early next week. Right now there will be a chance for rain Sunday through Tuesday, but the intensity of the rain will depend on how much moisture is pulled north from the Gulf. A little rain fell Monday evening and overnight, but it wasn't much. Where the rain did come down, less than a tenth of an inch was recorded. 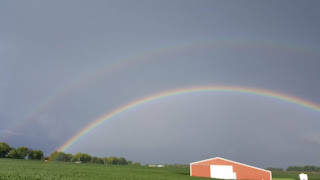 The heaviest rainfall remained over southern Iowa, Missouri and central Illinois. 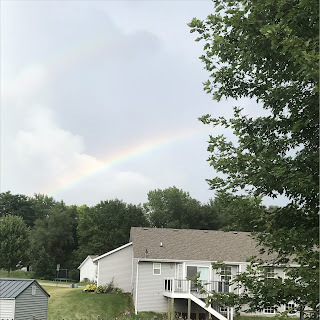 June and July were very rainy months for northern Illinois and southern Wisconsin, and the month of August has been quite the opposite. Officially in Rockford we've recorded only 0.61 inches of rain. Normally we should be a little over three inches this far into the month, putting us close to a three inch deficit. And with high pressure remaining the persistent weather feature this week, there is little opportunity for rain to fall straight through to the weekend. There is a weak upper level disturbance (mini-low) that works south out of Canada Wednesday and Thursday. Unfortunately this doesn't have a great deal of moisture with it, likely leaving our skies mostly cloudy., rather than rainy. Early next week could bring a few a showers, but a lot of the forecast depends on what will happen over the Gulf of Mexico with a potential tropical system that may develop later this week. Skies are starting to clear up across the Stateline as we have drier air flowing into our area. We had some lingering, thick cloud cover this morning after the front moved out, mainly because our dewpoint temperatures were still fairly high. Luckily, this dry inflow will lower our humidity and cloud cover going into the afternoon, as well as keep our temperatures a little cooler in the upper 70°s for our high. That dry inflow will clear our skies for the overnight, where we'll cool down to the low 50°s. The dry inflow will last the entire week, keeping the skies mostly sunny and allowing for temperatures to stay in the 70°s, and our humidity to stay low. We'll dip down to the low 70°s going into Thursday and Friday, but we'll start warming back up as we go into the weekend, hitting the low 80°s by Sunday. The reason for this cooling trend is because a high pressure system is going to gradually move towards our area as we progress through the week. During that time, the high will keep pulling in cooler air into our area, before we hit our coolest temperatures this week in the mid 70°s for Thursday and Friday. Once we get into the weekend, that high will track east, so it won't be able to pull in as much cool air. Because of that, we'll start warming back up a little bit during the weekend. Isolated showers and thunderstorms have developed this evening ahead of a cold front that is forecast to move through northern Illinois and southern Wisconsin early Tuesday. Our severe threat has lowered from earlier thinking today, but thunderstorms are expected to move in closer towards 9pm/10pm this evening. 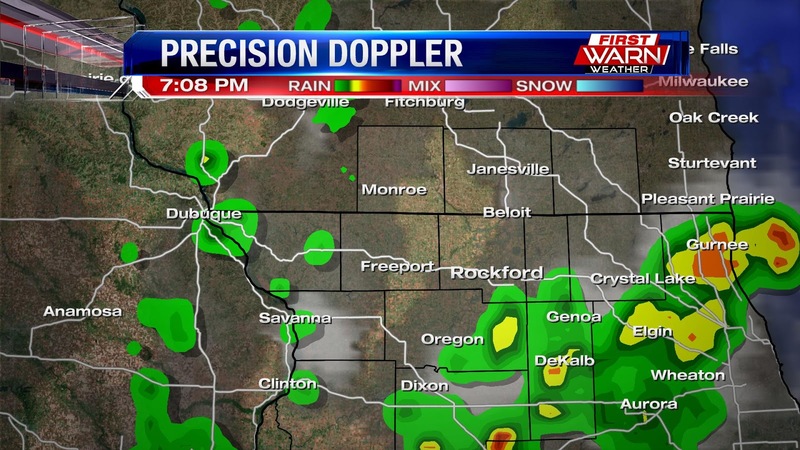 There are a few showers and isolated storms that have developed south of Rockford. These are along the leading edge of an increase in moisture aloft. 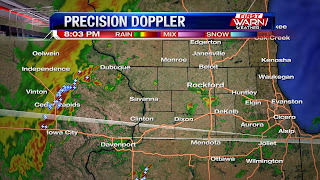 A more significant line of thunderstorms is currently moving into eastern Iowa and could impact our western and southwest counties around 10pm. Heavy rainfall looks to be the biggest threat with any of these storms, but some of the stronger cells will be capable of producing a strong wind gust or two. Thunderstorm coverage may increase around, and shortly after, Midnight as the cold front moves east. There will be a few lingering showers/storms Tuesday morning, but drier air moves in and will help clear some of the cloud cover by Tuesday evening. We had some thick fog out this morning, but that has since cleared out. 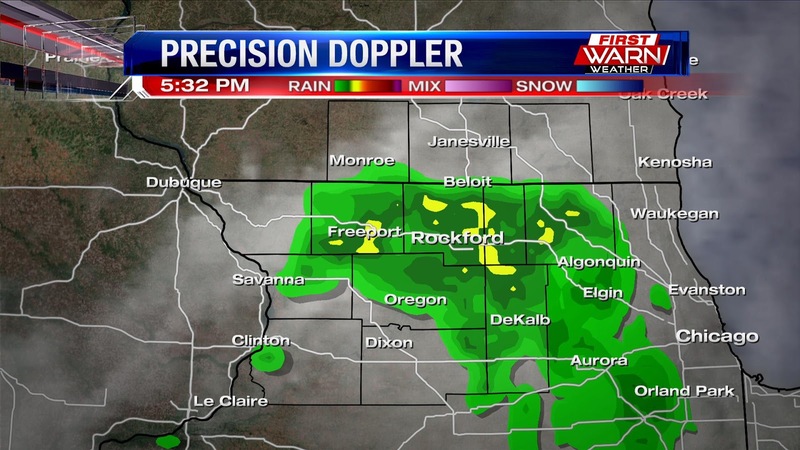 Light rain is tracking east across the Stateline, but is dying down and will clear out around mid day. Skies will be mostly cloudy, but it'll be a little less cloudy along the state line itself, so this would be the best viewing area for the eclipse at 1:16pm. Also, storm chances kick in around 1pm for our southern counties, which is another reason to go north for the eclipse as well. We are under a Slight Risk for severe weather for the late afternoon into the evening. The earliest we could see strong thunderstorms is 4:00pm, but the chances will increase during the evening. The main threats will be strong winds and damaging hail, so be sure to get your cars inside if possible because the hail may cause significant damage. The storms will linger during the late night hours, but the severity will go down as we progress through the overnight. The cold front will move around 7am tomorrow morning. You'll definitely want to keep an eye out for weather updates during the afternoon, because the eclipse may impact whether or not we see storms during the afternoon and evening, as temperatures will fluctuate during the eclipse. After the front moves out, high pressure will move in to bring us cooler and drier weather for the rest of the week. Temperatures will be in the upper 70°s to low 80°s this week, with the possibility of seeing the mid 70°s in the next couple of days. Rain Is Back . . . For How Long? After a nice weekend with temperatures right at our average of 82 degrees and nice views of the sun, rain has moved into the Stateline area. Our rain tonight is the first of a possible series of disturbances that will move through our area over the next couple of days. The rain is beneficial as we have had dry conditions lately and are 2.29 inches below where we should be in an average August. We have another chance for rain late morning into early afternoon tomorrow, and then a cold front pushing through late Monday evening will give us our greatest chance for rain and thunderstorms. The Storm Prediction Center has placed portions of the Stateline in the Slight Risk Area for severe weather tomorrow night, so stay tuned for updates throughout the day. In the morning we will give you updates on our eclipse viewing forecast for the start, peak and end of the eclipse event. Right now, it looks like we will have partly sunny skies and will be hoping for some good breaks in the clouds! 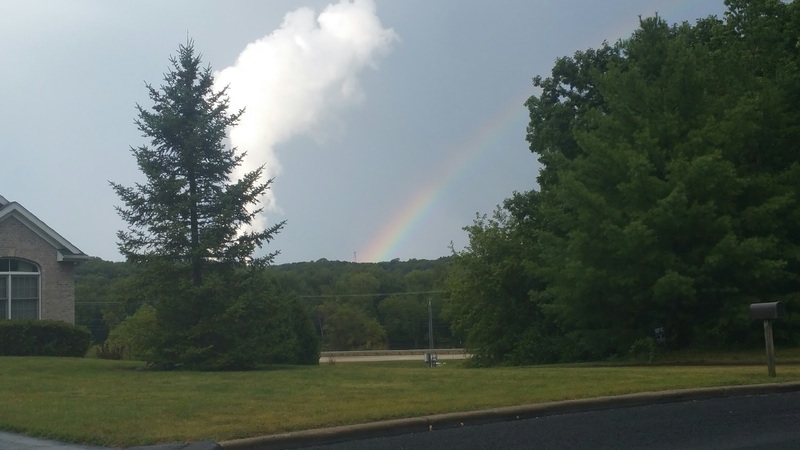 A Few Showers To End The Weekend . . .